This book unexpectedly blew me away. I went into this completely unaware of what it would be about. A group of us decided to read it together via Twitter and so my journey with Fliss and Margot began. Little did I know just how emotionally attached I would become to this wonderful story. Margot & Me tells the story of Fliss, a teenage girl who is relocating to a farm in Wales with her sick mother to live with her grandmother, Margot. Margot is not your average grandmother: she is not the cuddling type, but is a cold and stern older woman. As Fliss struggles to adapt to a very different lifestyle in Wales she comes across Margot’s diary from her time in the war. This sparks the beginning of an extraordinary journey for Fliss as she discovers a very different side to her grandmother: a side of Margot that Fliss never expected to find. When I initially started reading this I was not immediately swept off my feet. I didn’t particularly like Fliss at the beginning and wasn’t sure what I would make of this book. A few chapters in those feelings started to change and as I learned more about Fliss, Margot and the other characters I all of a sudden became lost in their world. For me, this story really picked up once Fliss found Margot’s diary. My absolute favourite parts of this book were Margot’s diary entries. Set during World War II, I found them so interesting and loved reading about her early life as an evacuee in Wales. There was something very special about those glimpses into Margot’s early life and it is so easy to understand by the end of the book why Margot is the way she is. So much happened to her and at times I was completely and utterly devastated by what I was reading, but it really cemented my love for her as a character. I also loved seeing Fliss’ journey in her new high school. We start off with her initial anxiety about being the new girl and worrying what the others will make of her. This book touches upon the stereotypical high school bully, those teenage crushes on teachers and more importantly the value of a good friendship. I knew immediately that I would love Danny and could vividly imagine him in my head. I think it is 100% safe to say that the last 4-5 chapters of this book just repeatedly hurt my heart. Every time I thought to myself, ‘Ok the pain must stop soon’ I found myself taking another hit. I definitely recommend tissues to people reading this book because there were so many different points throughout it where I really felt overwhelmed with raw and pure emotion which is a true testament to Juno Dawson’s incredible writing. Although initially I wasn’t hugely fond of Fliss, I did grow to really like her as a character. To begin with she seemed a little too stuck up for me and I wasn’t sure I would be able to connect with her. However as she learnt more about her grandmother she changed as a person, or at least came more into contact with her emotions, and I ended up really liking her. She was much more selfless than I initially thought and actually really inspiring. I thought Margot was a fantastic character and she was by far my favourite. Learning everything we did about her through her diary entries I can do nothing but empathise with Margot and completely understand why she is the way she is. But what lies underneath that cold hard surface is a strong-willed, fiercely passionate and inspiring lady. I would love nothing more than a book all about Margot! Before I leave this review, I have to mention two things. The first is that as a Welsh person I LOVED that this book was mainly set in Wales. I also quite enjoyed the way in which Juno Dawson crammed in just about every Welsh stereotype you could think of. From a whole plethora of Welsh names (Megan, Bronwyn, Dewi, Rhiannon), the use of Welsh language (‘Bore da’, cwtch, tampin’) and the typical Welsh stereotypes of sheep and male voice choirs, the whole thing just kept me thoroughly entertained and I couldn’t help but read along with a smile on my face and the occasional laugh out loud moment. My final point is that this book is INCREDIBLE at how much it deals with. Under no circumstance do I want to spoil anything in this book because I knew very little going in and I think that is one of the reasons I loved it, but I want to say a huge thank you to Juno for doing what she has done here. Highlighting sexuality, racism, grief, love, heartbreak, pregnancy and so many more issues in such a sensitive and suitable manner that were all relevant to the story being told but also gave reason to pause and think. Exceptional writing. Margot & Me is not a book I was expecting to fall head over heels in love with. I thought I would enjoy it but I had no idea of the profound effect it would have on me. All I can say is that this book certainly makes me realise just how much we have to learn from our elders and I know I certainly would love to know more about my own grandmother during her time in the war. Fabulous. 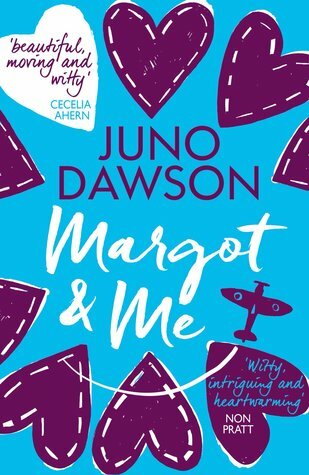 Have you read Margot & Me? What did you think? Do you have any recommendations similar to Margot & Me? Fab post! One of my favorites! Oh thank you! I loved this book and I’m glad you did too! I totally agree with this whole review! I couldn’t put it any better, even down to the uncertainty of liking Fliss! This book is definitely my favourite Juno Dawson book so far! Our little screams when we were the first two to finish! God this book is an emotional wreck eh?